LRT construction in Houston. A similar LRT line in Austin’s Guadalupe-Lamar corridor could potentially be completed and in service in less than a decade. Photo: Houston Metro. In our Feb. 10th article «Long saga of Guadalupe-Lamar light rail planning told in maps» we provided a selective summary chronicle of the exhaustive history of planning for major infrastructure upgrades — almost all of it light rail transit (LRT) — to expand capacity, enhance urban livability and the environment, and improve and sustain mobility in Austin’s most important central local corridor, Guadalupe-Lamar (G-L). Over 40 years of LRT proposals and studies were noted and maps associated with them were presented, among them several alternatives we’ve featured on this website. So, on the assumption that the critical mass of community and political support could be mustered to proceed, how long would it take to get an actual G-L starter line (the seminal “spine” from which extensions throughout the metro area and the region would subsequently branch) in operation? What milestones might there be along the way, and what might be typical (or at least realistic) timeframes for achieving each milestone? And could a new Project Connect-style study be initiated and concluded within about a year, in time to put a rail project funding measure on the ballot in 2016? In response to these issues, we’re posting here a somewhat fanciful and speculative timeline (based on the proposed 6.8-mile G-L-Seaholm line described in our “Plan B” article cited above), with some modestly rosy assumptions, but based on real-world experience elsewhere. In addition, it’s been vetted by a number of transit industry professionals and savvy advocates. Hypothetical timeline (click to enlarge). Our timeline assumes that some project phases could be accelerated or “telescoped” because so much previous study and analytical work has already been completed on this corridor (and some of the planning work involved in the Highland-Riverside proposal might also be applicable). Obviously, all dates (and phases) should be considered as hypothetical, and thus to have some room for adjustment. This information is mainly intended just to provide a general idea of a possible timeline for such a project in the G-L corridor. Typically, project timelines are meticulously developed by an entire project team and are subject to ongoing revisions. As our timeline suggests, it’s plausible to envision that a G-L LRT starter line project could be completed within about seven years from the start of conceptual system-level planning. This would lead to a possible opening of the line for service in 2022. To meet such a schedule, system-level planning (to develop a basic conceptual plan to present to the public and to voters for funding) would need to begin sometime later this year — ideally, in the early to middle autumn. Otherwise it would be difficult to finalize a plan for a public vote by November 2016. By far, the heavy travel flow in this corridor one of that most compelling features that cry out for the capacity, public attractiveness, and cost-effectiveness of urban rail (light rail transit, LRT). 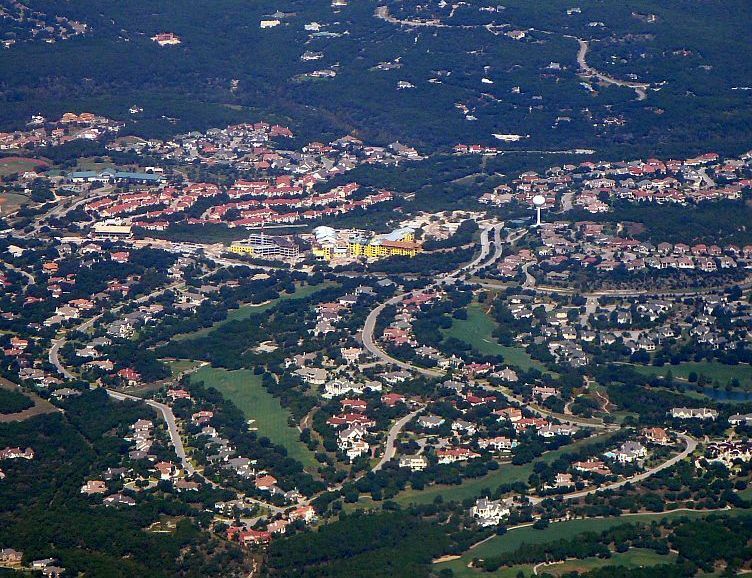 Study after study has documented the fact that this is the most intensely traveled inner-city local corridor — the only major corridor serving the city’s central axis between I-35 and Loop 1 (MoPac). 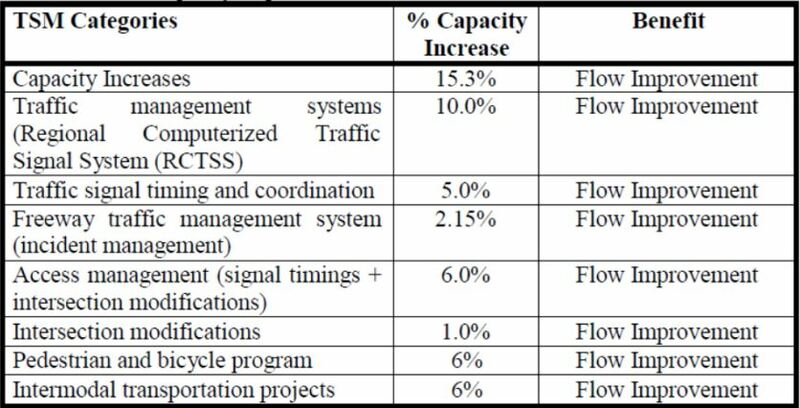 Now, the latest annual report of the Texas Transportation Institute (TTI), endorsed by the Texas Department of Transportation (TxDOT) not only strongly corroborates these assessments, but provides data that further emphasize the key importance of the G-L corridor. This conclusion merely corroborates a reality that has changed relatively little in more than 50 years — a saga of planning for this crucial central corridor that can be more fully grasped in the following series of maps spanning over five decades. As early as 1962, the Guadalupe-Lamar corridor was proposed as the route of a Central Freeway (also designated a Central Expressway) in a regional transportation plan produced by the Texas Highway Department (predecessor of the Texas Department of Transportation, TxDOT). 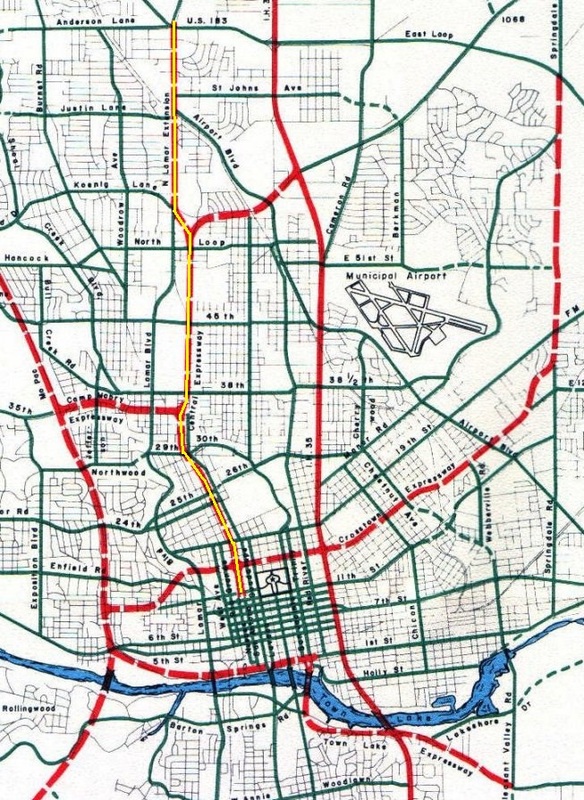 The map below, an excerpt from the larger 1962 regional map in the official report, zooms in on roadways planned for central Austin, with proposed freeways shown as dashed red lines. We’ve annotated the Central Freeway in the Guadalupe-Lamar corridor (running north-south just to the left of center) with an additional yellow line in the middle of the red. Central Freeway Starting downtown just west of the Capitol, this freeway would have been located a block or two west of Guadalupe and proceeded northward up to the UT campus, where it would join Guadalupe and follow Guadalupe northward to Koenig lane. It then curved to follow the route of Lamar street. 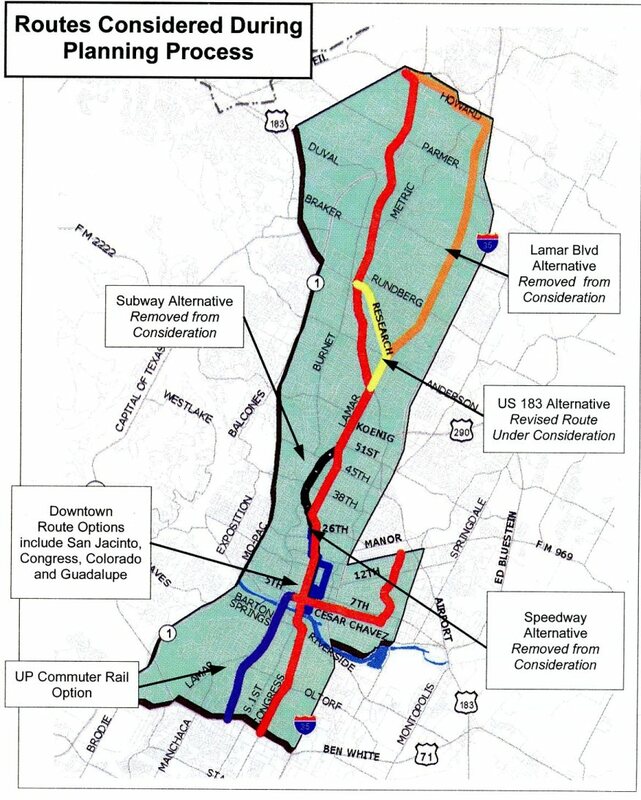 A light rail line was planned for this route in 2000, but was narrowly rejected by Austin voters in November 2000. 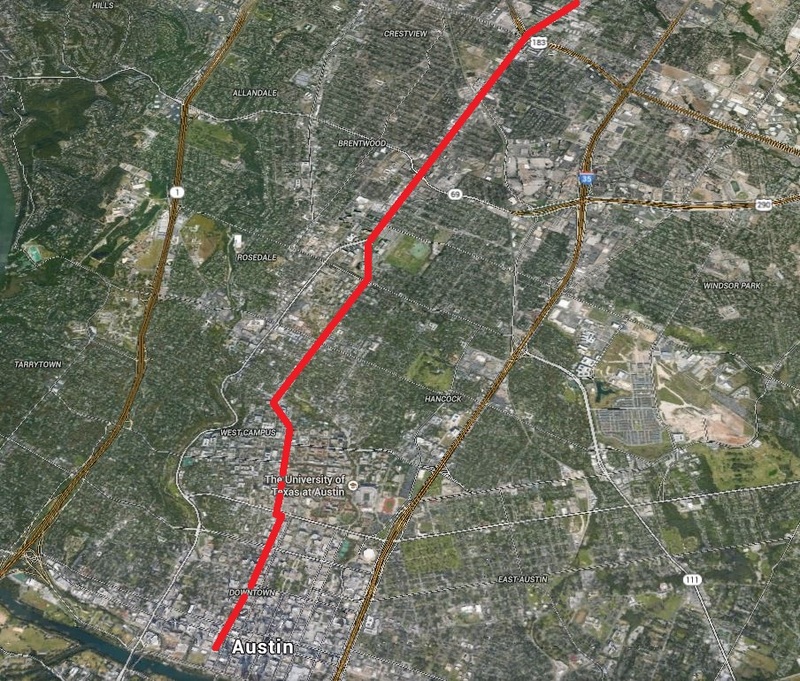 In the long run, there is still a very good chance that light rail will be built on this route. The prominence of the Guadalupe-North Lamar travel corridor, the need to effectively provide access to major core activity centers including the University of Texas campus, the Capitol Complex, and downtown, plus the looming prospect of a major freeway to cut through the heart of the city, prompted strong interest in exploring public transit alternatives. Starting in the 1970s, these began to emerge. 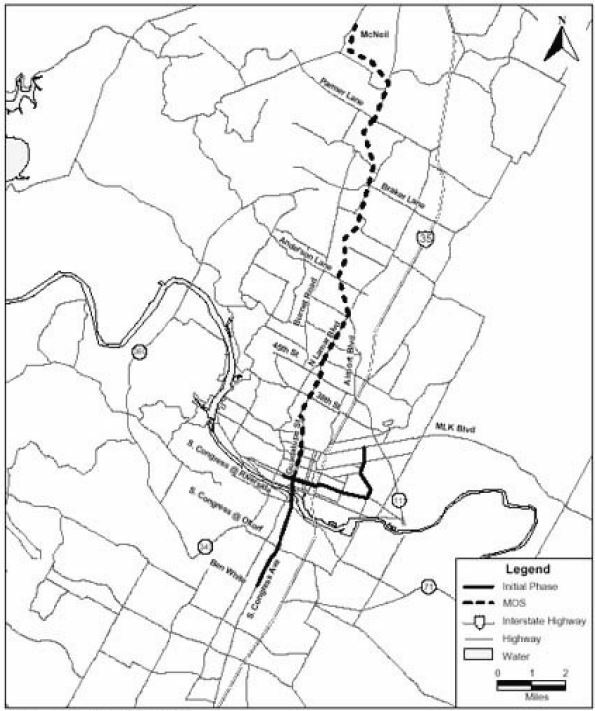 CARTRANS report (left) proposed LRT 19.2-mile route (right) stretching from north to south Austin and paralleling major central flow of travel along North and South Lamar, South Congress, and I-35. Photos: ARN. 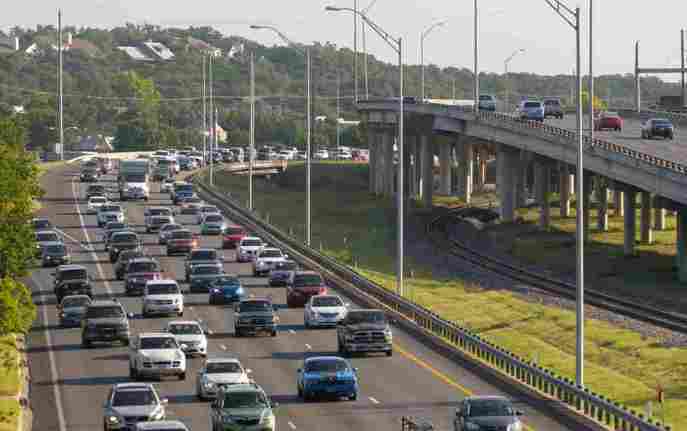 Published by the Washington, DC-based RAIL Foundation, the CARTRANS report quickly garnered interest and support from the Austin City Council and much of Austin’s top civic leadership. This catapulted rail transit — previously disparaged as inappropriate for any Texas city — into a possibility under serious consideration as a realistic public transit alternative for the central city. 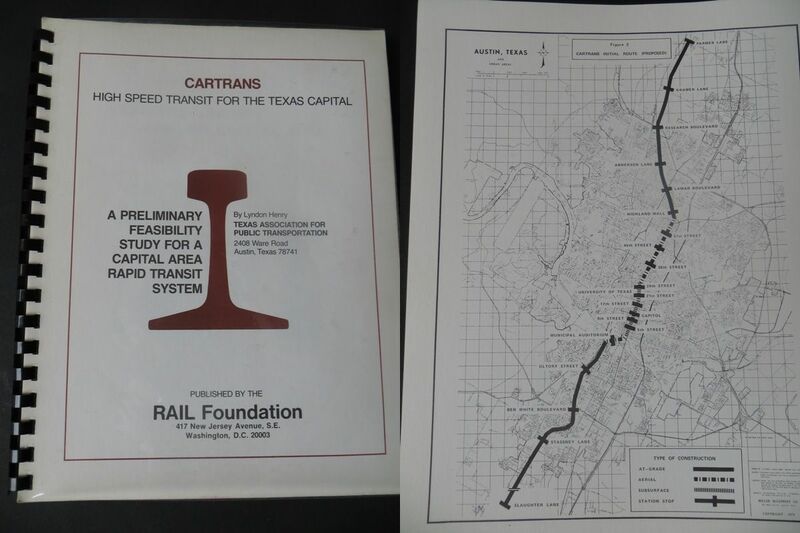 ► Capital Metro planning in early 1990s — After approximately a decade of additional transit planning conducted mainly via the Austin Transportation Study, civic interest and public excitement over the possibility of an Austin rail transit system (particularly as an alternative to the metro area’s increasingly congested and dangerous roadways) helped facilitate creation of the Capital Metropolitan Transportation Authority (CMTA, Capital Metro) in 1985. Subsequently, the agency’s initial major planning effort, the Transitway Corridor Analysis Project (TCAP), having concluded in 1989 with robust community involvement, led to the designation of LRT as the agency’s Locally Preferred Alternative (LPA, a federally required decision). 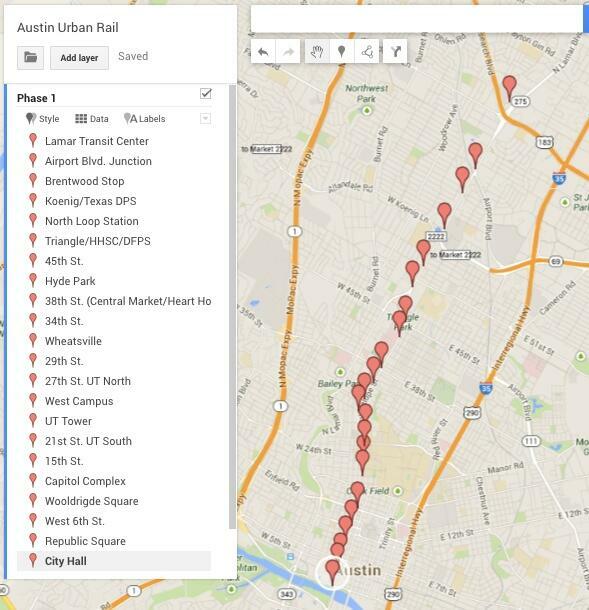 Also emerging from the TCAP experience was the concept of connecting access to the northwest metro area, via the City of Austin’s newly acquired railway line, with the Guadalupe-Lamar corridor, serving multiple destinations, established and high-density neighborhoods, the University of Texas (UT), Capitol Complex, and downtown. In addition, most local transit advocates, including TAPT, as well as local planners and decisionmakers realized that a surface LRT system (rather than significant subway or elevated infrastructure) was best suited for Austin’s scale and financial resources. Beginning in the early 1990s, Capital Metro contracted with a consulting team led by E.P. Hamilton & Associates to conceptually design and evaluate a surface-routed electric LRT alignment to serve primarily the Guadalupe-Lamar corridor plus a segment of Austin’s northwest corridor, served by available “opportunity assets” including the now publicly owned railway line as well as the major arterials North Lamar and Guadalupe St. Also included was a short additional spur into East Austin, using a segment of the same CMTA railway. As with all such proposals, this was envisioned as merely a “starter line”, seen as the first crucial leg of an ultimately multi-route system serving the entire metro area. 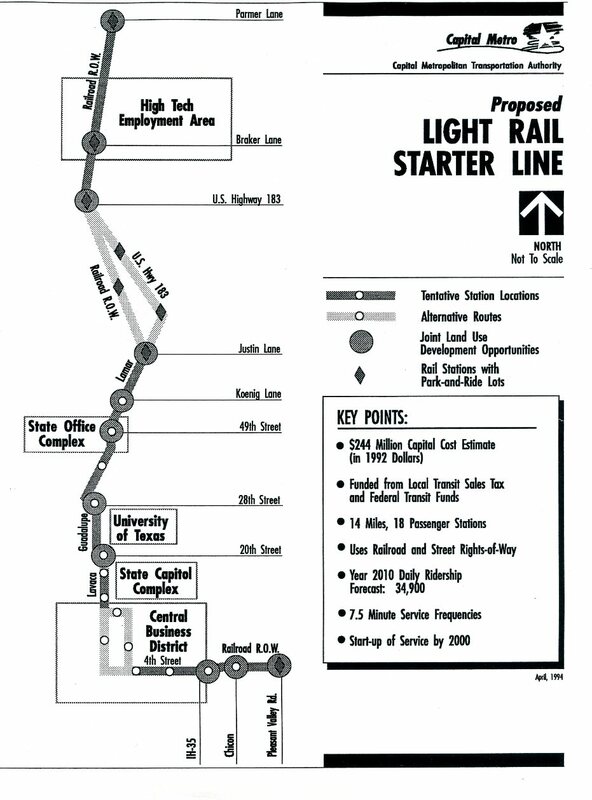 ► Capital Metro 2000 LRT plan — During the mid-to-late 1990s, Capital Metro changed course somewhat to focus on a possible diesel-operated rail service exclusively on the agency’s railway. Mainly because of this, and political and organizational upheavals at Capital Metro, the 1994 plan was effectively shelved … only to be resurrected, almost intact, in 1999-2000 by a reorganized Capital Metro board chaired by tech industry executive Lee Walker. In a charette convened by the agency, dozens of national transit industry professionals reaffirmed the primacy of the Guadalupe-Lamar and northwest travel corridors, and endorsed the need for a line very similar to the 1994 proposal. While Capital Metro’s LRT initiative was rejected in a November 2000 referendum, it lost by less than one percentage point — and actually got a solid majority vote within the City of Austin itself. This thread of public support would help keep the project alive. During this period, intensive planning for LRT, particularly in the G-L corridor and downtown, continued, with vigorous public meetings and consultations. Included in these activities was the extensive involvement of community activists and residents of neighborhoods along the proposed route, much of it focused on developing and finalizing neighborhood station-area plans with the aim of effectively utilizing the anticipated resource of LRT. These planning efforts continued until the RTP’s activities were effectively curtailed and eventually terminated as Capital Metro abruptly ended planning for LRT in the G-L corridor in mid-2003 and turned instead to developing a diesel-operated “urban commuter rail” line (in effect, a revival of a very similar concept from the mid-1990s). That effort led to voter endorsement of the plan in November 2004, and the Red Line, rebranded as MetroRail, opened in the spring of 2010. This led officials and planners to try to solve the problem with various schemes, including “connector” buses, then the MetroRapid bus project, and some kind of rail “circulator” that would connect the commuter-like MetroRail with key destinations. As our article cited above explains, a streetcar scheme morphed into a more robust LRT concept that included both a route on East riverside Drive and a more central line running through the east side of downtown, UT’s East Campus on San Jacinto Blvd., and on into the Mueller site, first via Manor Road, then eventually via a route using Red River St., Hancock Center, and Airport Blvd. to access Mueller. Any vestige of LRT in the city’s most heavily traveled central local arterial corridor — Guadalupe-Lamar, including access to the West Campus and the business commercial district and established neighborhoods along it — was abandoned. • Guadalupe-Lamar is highest-density corridor in Austin — according to Project Connect’s own data! 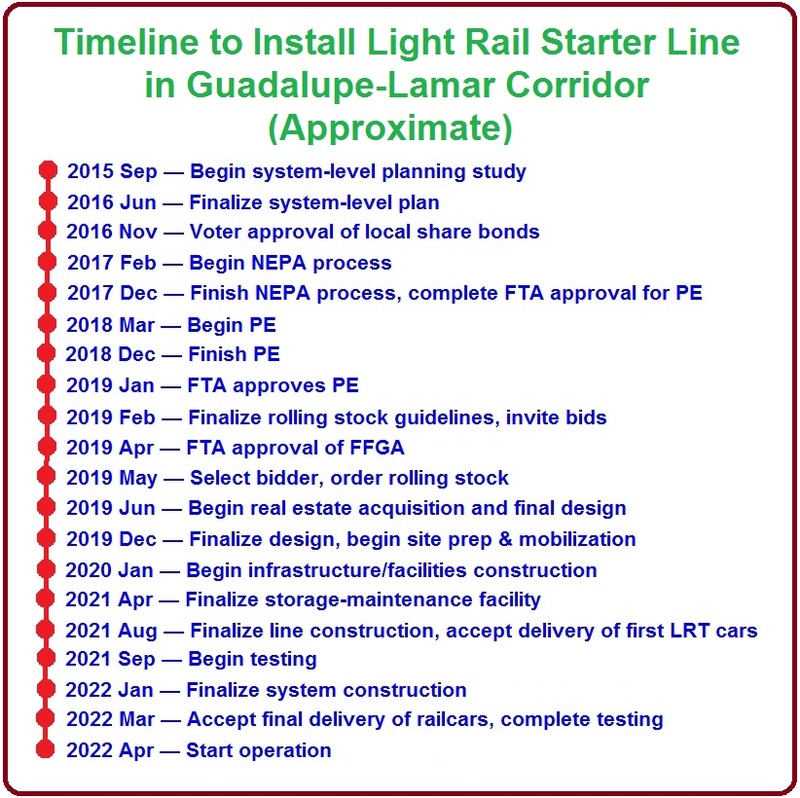 This community involvement, including the efforts of TAPT and the Light Rail Now Project, has led in more recent years to a series of alternative proposals for LRT/urban rail alignments in the Guadalupe-Lamar corridor, as described below. 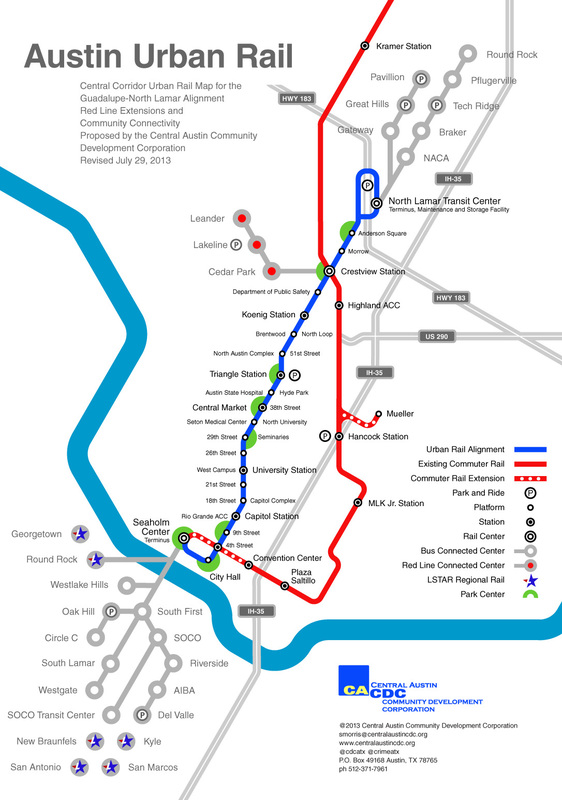 The CACDC route would extend from the North Lamar Transfer Center, down North Lamar past the Crestview station, through the West Campus area, to 4th St. From there, it includes an eastward spur to the Seaholm development site, and also proposes a short spur line branching from the existing MetroRail Red Line into the Mueller development site. ► Skinner proposal — In late November 2013, while debate raged over the Highland-Riverside route recommendation just presented by the Project Connect study team, community activist Adrian Skinner, a member of Austinites for Urban Rail Action (AURA) group, posted on Twitter a map of a proposed urban rail route along the G-L corridor. Skinner’s annotated map (below) indicates nearly two dozen significant points that would be served, from key activity centers to major neighborhoods. 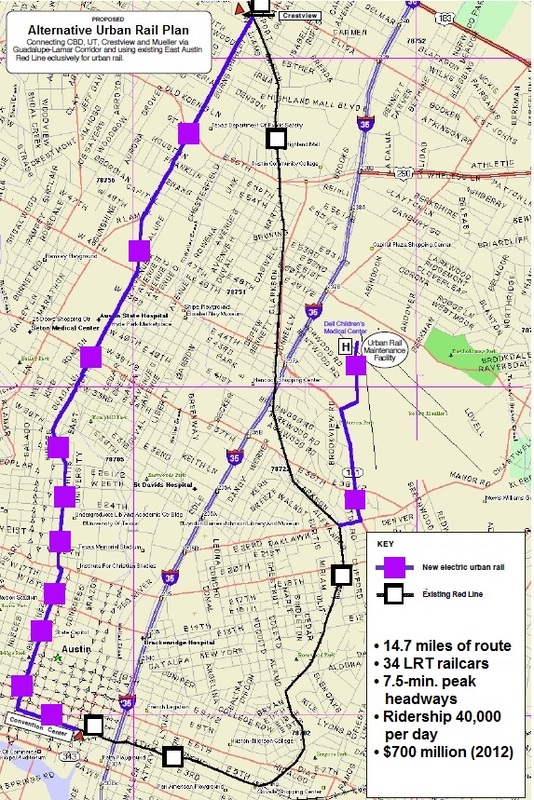 Adrian Skinner map (Nov. 2013) shows important points that would be connected by urban rail in Guadalupe-Lamar corridor. Screenshot: L. Henry. Apparently, they’re willfully ignoring that there definitely is a “Plan B”. All along, there’s been an alternative urban rail project on the table … and it’s ready to replace the Project Connect/Prop. 1 plan if it fails. Our proposal aimed to provide an example of a “Plan B” for the Guadalupe-Lamar corridor, “a plausible and fairly simple option for an LRT starter line aimed at minimizing design and cost while providing an attractive service with adequate capacity.” As our above-cited article explains, the plan assumes “a 6.8-mile line starting at the North Lamar Transit Center (NLTC, Lamar and U.S. 183) on the north, running south down North Lamar and Guadalupe, then Guadalupe and Lavaca to the CBD, then west on 4th and 3rd Streets to a terminus to serve the Seaholm development and Amtrak station at Lamar. Capital investment cost was roughly estimated at $586 million (2014 dollars), of which it was assumed 50% (less than $300 million) would be locally funded and the other 50% funded via FTA grants. For this proposed line, our plan also assumed “30,000 to 40,000 as a plausible potential ridership range …, based on previous forecasts for this corridor plus factors such as the interconnection with MetroRail service at Crestview, and extensions both to U.S. 183 and to the Seaholm-Amtrak site.” The route, and several of the most important activity centers served, are shown in the annotated map below. Starting at the North Lamar Transit Center at U.S. 183, this route would follow North Lamar Blvd., Guadalupe St., Nueces St., San Antonio St., and finally Guadalupe and Lavaca St. past established central Austin neighborhoods and activity centers, through the West Campus, past the Capitol Complex, and into Austin’s CBD. Brad’s proposal underscores the fact that there’s a variety of ways that LRT can be fitted into this constrained but high-volume traffic corridor. Parsons’s map, shown below, includes markers indicating key points of interest along the route. The experience of more than five decades can be summed up in several major takeaways. 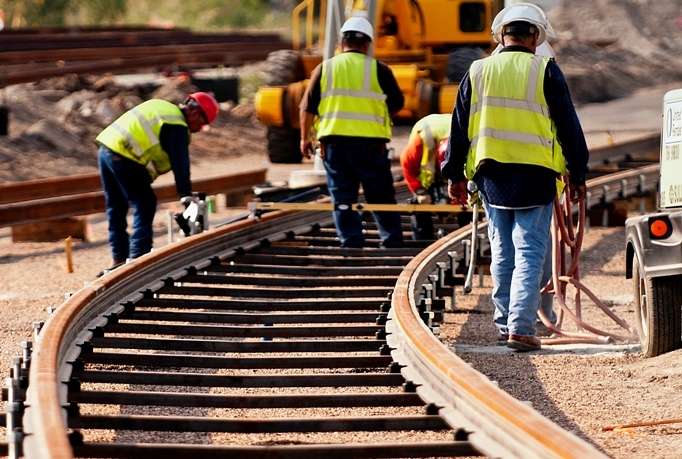 • Clearly, the importance of Austin’s most central travel corridor is underscored by the long history of study and design efforts that has been concentrated on major investments to expand capacity and expedite access, and on planning for a rail line in particular. • It should be apparent that an enormous volume of examination, evaluation, and analysis has reflected the significant attention — from both the community at large and official agencies — brought to bear on the Guadalupe-Lamar corridor. This has produced an abundance of previous federally approved documentation of the need for LRT in the corridor. In this context, the need for additional study should be minimal — mainly minor updating and evaluation of alignment and design issues. Recommendations to “go back to Ground Zero” and “start again from scratch” amount merely to a recipe for further delay and dithering. There’s no need for further studies of the re-studies of the re-studies of the studies. It’s high time to finalize a workable, affordable, effective LRT project for this key center-city corridor, and move forward with it. • Support for LRT among Austinites has endured. This is substantiated by evidence, for example, we’ve shown in our earlier-cited article «Strong community support for Guadalupe-Lamar light rail continues — but officials seem oblivious». Bolstering this is the support of neighborhood associations, community activists, and residents along in the corridor itself — “the extensive involvement of community activists and residents of neighborhoods along the proposed route” noted earlier has translated into a series of endorsements of G-L LRT from neighborhoods. See: Community endorsements. Rendition of LRT on the Drag (2000). Graphic: Capital Metro, via Light Rail Now. The following comments, slightly edited and adapted here to webpage format, were distributed via Email to members of the Austin City Council on 9 February 2015, prior to a “Data Dig” workshop session on transportation and mobility scheduled for later in the day. Dave Dobbs is Executive Director of the Texas Association for Public Transportation and publisher of the Light Rail Now website. Once again this afternoon [9 Feb. 2015] Austin will see the kind of insider staff behavior that led voters in November 2012 to choose our current 10-1 city council format in the hope of more open government and real community input. Alas, it seems that staff has learned nothing from the failed Project Connect Urban Rail debacle after pro-rail advocates spent five years, starting in September 2009 with the COA [City of Austin] Transportation staff, warning the staff, the council, the Transit Working Group (TWG), and the Central Corridor Advisory Group (CCAG) that the pre-determined Downtown Austin Plan 2008 streetcar proposal (note 1), that essentially became Project Connect’s (PC) Urban Rail plan, and the gerrymandered planning process to justify it that was devoid of true public input, would be a failure at the bond ballot box. Repeatedly we pointed out, three minutes at a time, with handouts and on several websites, that any new urban rail starter line had to utilize the Guadalupe-North Lamar (G/L) corridor to get the ridership required to justify the capital investment and operating costs of urban rail. 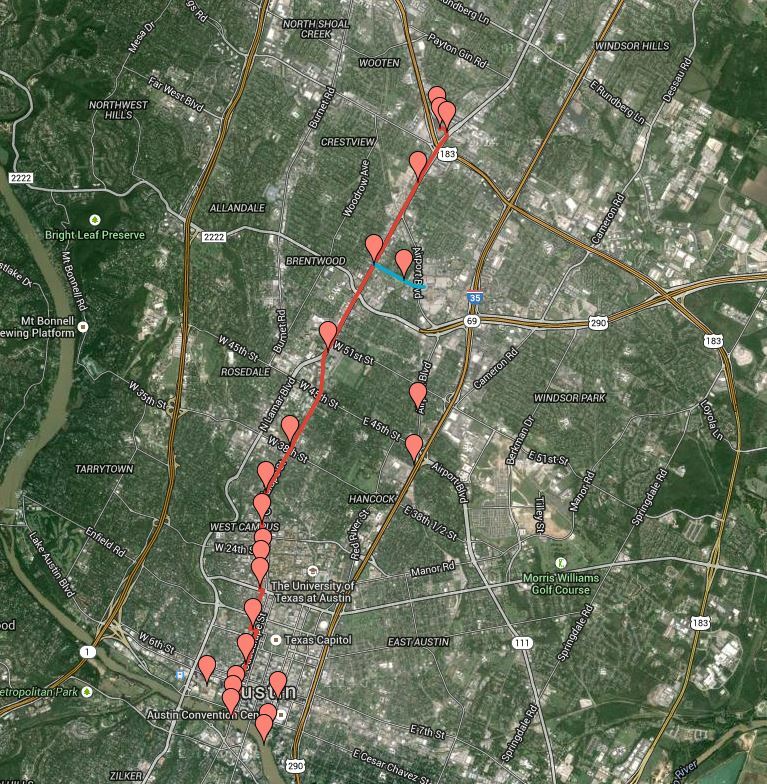 And we had Federal Transit Authority (FTA) and Texas Transit Institute (TTI) data to support it. (Notes 2 and 3) Additionally, we offered well-thought-out detailed G-L alternatives that were far more cost-effective — only to be ignored. Today you will not hear a balanced assessment of Austin’s transportation situation or get many real solutions to address our problems because staff has ensured that the deck is stacked against it. Please note that there is no backup material posted with today’s agenda and no list of participants, but of the ten speakers I am told will be present, eight either publicly endorsed the Project Connect Rail Bond Package and/or represent organizations that endorsed, or were complicit in, this wasteful ill-advised exercise of top-down insider back-room-deal-making trying to con the public into tying your hands as new council members with an issue you need more time to study and digest. Imagine where this council would be if the Project Connect Rail Bonds had passed and you were politically mandated to issue $400 million in Certificates of Obligation (COs). There wouldn’t be any air left in council chambers, today or any other day as special interests clamored continuously for a piece of asphalt public pie. Only Jim Skaggs of COST and Julio Gonzalez Altamirano of AURA represent the public that prevailed November 4th. On election day 58% of the public said No to the Project Connect Proposition, and yet today 80% of your speakers will be de facto representatives of the minority position. You should ask why you’re not hearing from former Capital Metro board member and former CMTA [Capital Metro] planner, Lyndon Henry, the person who first brought the light rail concept to Texas, the man most responsible for creating Capital Metro in the early 1980s, and who has, since 1970, made urban rail for Austin and better public transit his life work. Many of his papers for implementing rail in our capital city can be found at the Austin History Center. Mr. Henry holds a Master’s Degree from UT in Urban and Regional Planning, is well represented in professional papers peer-reviewed and accepted by the Transportation Research Board, National Academy of Sciences, writes for Railway Age, and led the public opposition to the PC bond package in public meetings and through our blog, AustinRailNow.com. If you want to know who, what, when, where, which, how and why about Austin transit, Lyndon Henry is an invaluable resource for elected officials wanting to understand our city’s mobility issues. Another person who should be on your agenda is Scott Morris, Director of the Central Austin Community Development Corporation (CACDC), who early on recognized that city management and the previous council were abandoning the core neighborhoods with rail plans primarily to benefit developers, rather than to provide essential rail transit to keep the city’s congested core alive and growing. Scott’s PAC [political action committee], OurRail.org, played a major role in organizing rail advocates and core neighborhoods to support a Guadalupe-Lamar rail plan and to oppose the Project Connect package voters rejected November 4th. Mr. Morris can offer council considerable political insight and knowledge about Central Austin housing, jobs, and transportation issues and needs, and I recommend his counsel highly. You are currently browsing the _______________Austin Rail Now blog archives for February, 2015.